Young infants are suffering from damages to their tissues, organs and body parts due to complications in child birth. The physical pressure of being damaged in such a fragile condition builds trauma among babies, and parents seek proper diagnosis in treating these abnormalities before they evolve into long-term weaknesses. Medical imaging science such as radiology is gaining traction in pediatric care. New pediatric radiology devices are improving the diagnosis of children and extending the scope for preventive cure and effective treatment. Medical device manufacturers are developing advanced pediatric radiology devices to tackle the growing incidence of birth traumas recorded across the globe. Companies namely, Analogic Corporation, Fujifilm Corporation, Esaote SpA, Hitachi, Ltd., General Electric Company, Koninklijke Philips N.V., Toshiba Corporation, Mindray Medical International Limited, Siemens AG, and Samsung Medison Co. Ltd. are widely recognized for instrumenting the global pediatric radiology device production. Transparency Market Research’s latest forecast study on the global pediatric radiology market has projected that these players will remain actively involved in manufacturing pediatric radiology devices across the globe during the forecast period, 2017-2026. The study further estimates that by the end of 2026, more than US$ 3.57 Bn worth of pediatric radiology devices will be sold across the globe. 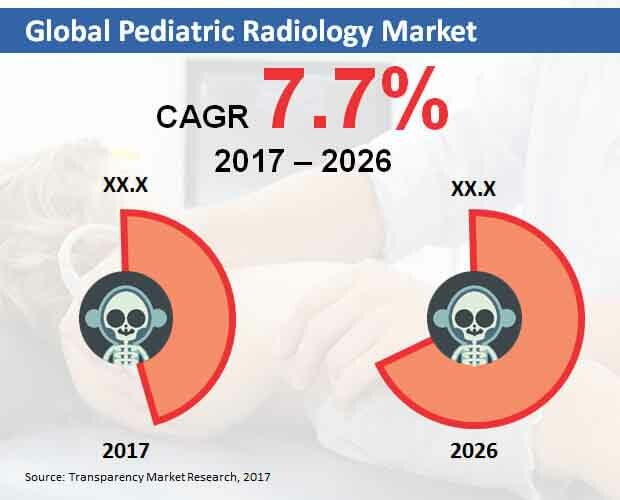 The report also assesses that the global pediatric radiology market will expand at a 7.7% CAGR, reflecting a robust growth during the forecast period. Conventional radiology techniques such as X-ray imaging are predominantly used in the current pediatric radiology landscape. In 2017, around US$ 640 Mn worth of X-ray devices were sold in the global pediatric radiology market. The report also reveals that the demand for X-ray systems is anticipated to dwindle towards the end of 2026. New pediatric radiology devices are being equipped with ultrasound functionalities to offer greater imaging accuracy and enhanced diagnostic precision. By the end of the forecast period, ultrasound products will outsell X-ray products by bringing in global revenues worth over US$ 1.45 Bn. Effectiveness of standalone pediatric radiology devices is influencing the sales trends in the global market. Standalone imaging modality of pediatric radiology devices continues to be more convenient of medical professionals such as radiographers. The report observes that throughout the forecast period, more than 55% of pediatric radiology devices being sold in the world will be developed on standalone modality. Portable pediatric radiology devices, on the other hand, are estimated to register fastest CAGR of 9.5% over the forecast period. The report also reveals that hospitals will be the largest end-users of pediatric radiology devices in the world. In 2017, nearly 48% of the overall pediatric radiology device sales were registered by hospitals across the globe. The report also estimates that pediatric clinics will register the fastest end-use of pediatric radiology through 2026. By the end of forecast period, the end-use of pediatric radiology devices in pediatric clinics will bring in over a billion dollars in global revenues. In several regions, pneumonia tops the list of prevalent disorders occurring in infants after child birth. Access to effective pediatric radiology can aid the health of such ailing babies and improve their life expectancy. In the US, the incidence of new-born babies being infected with the HIV is considerably high. The report projects that sales of pediatric radiology devices will remain predominantly high in North America through 2026. By the end of forecast period, North America’s pediatric radiology market is expected to touch US$ 1.34 Bn valuation. The report also reveals that majority of pediatric radiology devices will be manufactured in the Asia-Pacific excluding Japan (APEJ) region. Over the forecast period, the APEJ pediatric radiology market is pegged to register fastest expansion at an 8.5% CAGR.